Today’s post is brought to you in collaboration with Gluten Free Cheerios. All opinions are 100% mine. 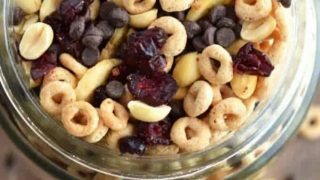 This Cereal Trail Mix are the perfect solution to busy mornings. They’ve got the flavors you’d expect in a bowl of cereal but in the form of a portable breakfast or snack. I have a confession. I love plain cereal. I have never, ever loved those sugary sweet cereals that are so popular. Don’t get me wrong, I do love a little sweet with my cereal, I just don’t want it so over-the-top sweet that’s all I can taste. I’ve just always been a plain cereal type. I probably get it from my grandparents. Cereal with them when I was growing up was a standard plain cereal topped with raw almonds and honey. I’ve been eating my cereal like that ever since. Sometimes, there’s really nothing better in the morning than a bowl of classic Cheerios™ topped with some almonds, honey, and banana. And please don’t forget to drink the milk. 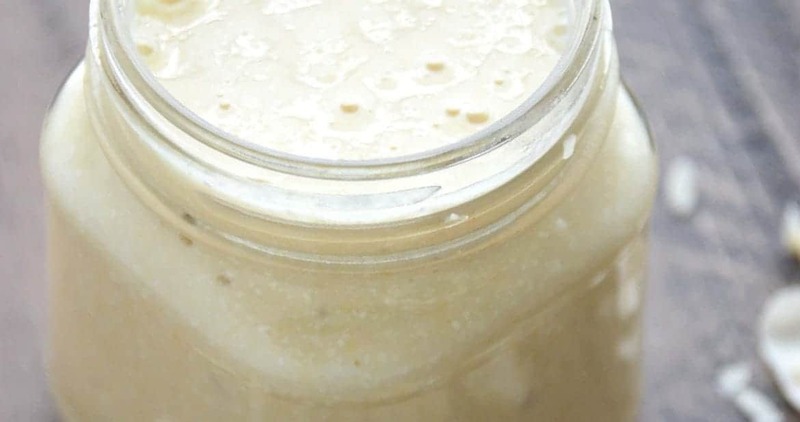 Milk sweetened with cereal and honey… so good. They should bottle that stuff. And that, my friends, is an utterly satisfying breakfast (or lunch!). These days, as crazy as it sounds, I don’t always have time to sit and eat my breakfast. Whether we’re running out the door to go somewhere or I’m trying to multi-task in the kitchen, I often find myself eating a breakfast that is portable or something that won’t sit in a bowl and get soggy before I get a chance to take another bite. This Cereal Trail Mix is the perfect solution for me. It’s got all the flavors from my favorite bowl of cereal (minus that magnificent milk) with the Cheerios and banana chips but portable and can keep up with me wherever I go. Plus, the dried cranberries add a great contrast to the sweetness from the bananas and chocolate chips. 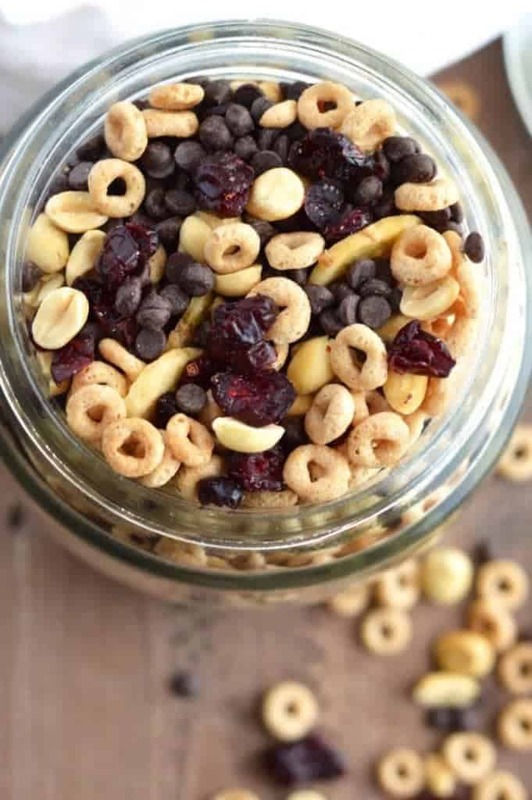 For this Cereal Trail Mix, I used original Cheerios, although Honey Nut would be great too! Plus, if you haven’t noticed, they’re sporting a new look with a Gluten Free label right on front. Cheerios were always one of Adam’s favorite cereals before going gluten free. While I have always been an Original and Multi Grain girl, Adam liked the Frosted Cheerios, Apple Cinnamon and Honey Nut ones. The guy’s sweet tooth even carries over to breakfast; it doesn’t stop at chocolate. Much to his delight, all five of those flavors are now gluten free (insert dancing emoji here) Adam is gluten intolerant but is now able to enjoy his once-beloved breakfast. Life is good, friends. 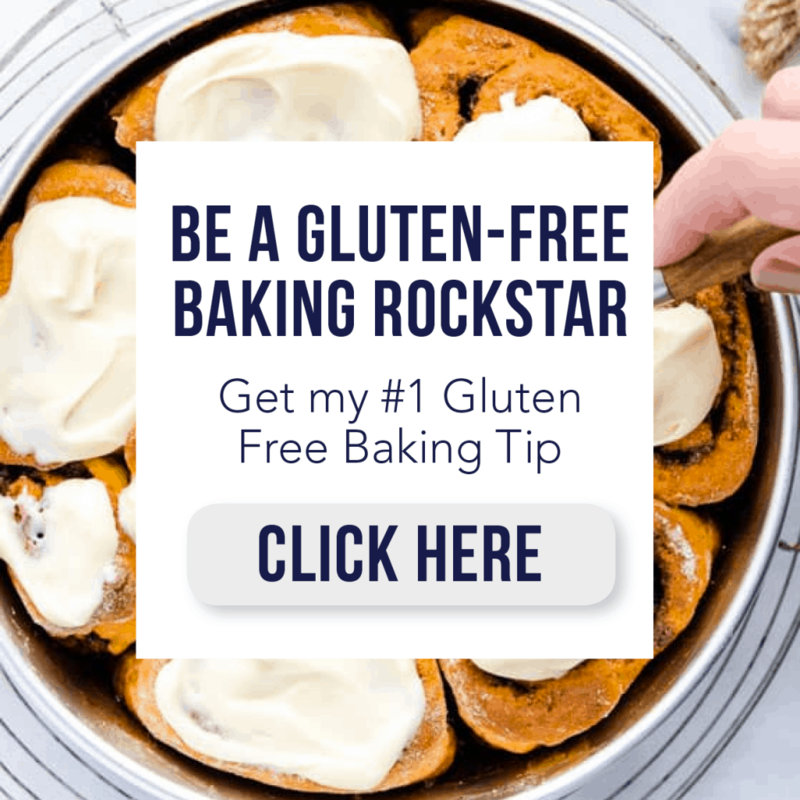 While Gluten Free Cheerios may sound different (and they are because stray wheat, rye, and barley have been removed from the naturally gluten-free oats) the taste you knew and once loved is the same. Boxes upon boxes of Gluten Free Cheerios are rolling out nation-wide and are clearly marked with the gluten free label. While General Mills has made vast steps to make Cheerios safe for larger populations to eat, please do your own research and make your own choices based off of the needs of you and your family. Please feel free to visit http://www.cheerios.com/GlutenFree/ to learn more. Be sure to follow me on Instagram and hashtag #whattheforkfoodblog or tag @whattheforkfoodblog – I love seeing what you make! 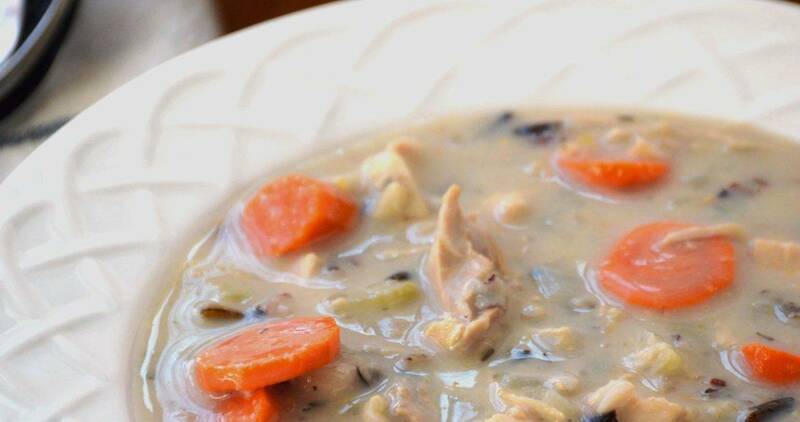 Combine all ingredients in a large bowl and store in an air-tight container up to 2 weeks. *I prefer it with almonds but the peanuts are easier for my girls. 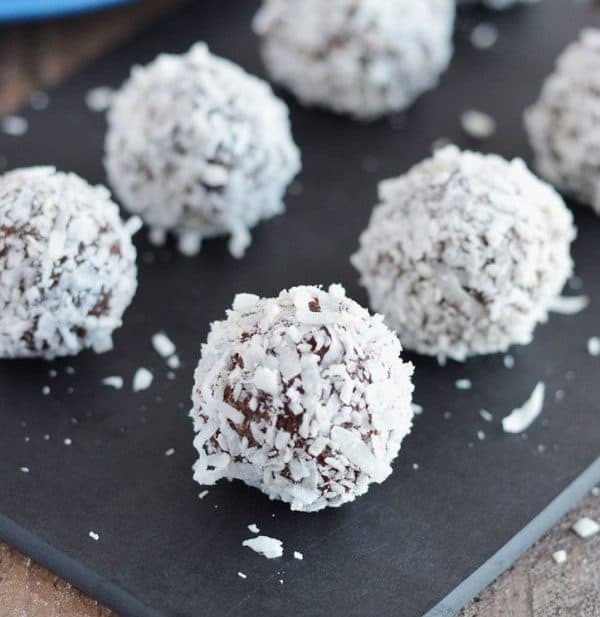 Follow Sharon | What The Fork Food Blog’s board Healthy Snacks on Pinterest. I LITERALLY just bought these yesterday because my husband has been stalking the cereal aisle until they came out. He recently went GF is OBSESSED with cheerios, so he was a very happy man yesterday. This would be perfect for him to snack on! Pinned! My little guy would love snacking on this! Such a great idea! Dear Sharon, I have four boys and my littlest guy Hudson has Down syndrome. He’s a very picky eater, but I know he will eat this fun snack. Will be perfect in his lunchbox. thats for the inspiration! This is such a clever way to sneak in a nutritious breakfast!! We must be thinking on the same wavelength! Just used Cheerios to make a yummy snack 🙂 I’m a plain cereal kinda gal, too, and this is one of my favorites! What a great snack! They’re making all those varieties GF?! That’s awesome. 🙂 This trail mix looks great, too! We’ve really enjoyed the new gluten free Cheerios, I’ve had to stop myself eating them out of the box by the handful! Your trail mix looks lovely, my kids would really like it! I need to get mu hands on some of those GF cereals as this cereal trail mix NEEDS to happen! It’s not only portable – but so much fun to make and eat! Oh cheerios is the classic breakfast time treat! And I could snack on this treat all day…like on a road trip! This sounds like a great mix, Sharon! 🙂 I love Cheerios!